A) a wryly funny piece of early noughties nostalgia that fondly looks back with some amusement at a once-massive, but now only dimly remembered episode in British cultural history. Namely, the incident of Charles ‘The Coughing Major’ Ingram, who won the popular TV quiz show ‘Who Wants to be a Millionaire’ in 2001 only to be prosecuted over evidence that his wife Diana and an accomplice were coughing to signal the correct answers to the show’s trademark multiple choice questions. B) a more thorough and studious excavation of the above that goes to some lengths to suggest that Ingram was not guilty, but inadvertently ‘framed’ by paranoid show producers who’d convinced themselves of a scam that wasn’t there and used selectively isolated and edited mic recordings to present an inaccurate version of the sound of the room. C) an astute comment on the legacy of reality TV and the means by which its creators have almost blithely reshaped the world into one in which essentially trivial dramas are given the same weight as global crises. D) a piercingly brilliant dissection of the British penchant for mob-mindedness and mass hysteria. 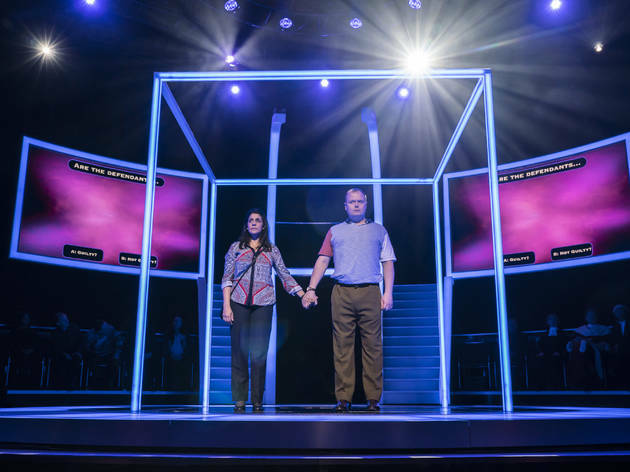 The answer is probably all of the above, and what a kinetic, eccentric, furiously exciting show James Graham and his director Daniel Evans have crafted. Transferring in from Chichester Festival Theatre, this is Graham’s fourth West End show since the tail end of 2016, a pretty remarkable achievement. ‘Quiz’ exhibits his traditional strength: an unerring ability to find significance in the marginalia of contemporary history. It also has his usual weaknesses – his characters are thin, if not necessarily unconvincing. But it feels like the first of his ‘mainstream’ plays to successfully harness the love of formal experimentation previously only seen in his more obscure work. Styled like a quiz show blurred into a courtroom drama, it puts naturalism to the sword, bombarding us with a wilfully ridiculous portrayal of ‘Millionaire’ host Chris Tarrant (brilliant work from Keir Charles), offering both a hilarious brief history of British TV quiz shows and an actual quiz for the audience. (Full disclosure: your humble critic won the press night quiz). It is an extremely fun evening. But it has a lot of smart points to make, most pointedly that the reality TV era and the fake news era are effectively the same thing, and that our hunger to see everything as a story or narrative means those stories can be tampered with. 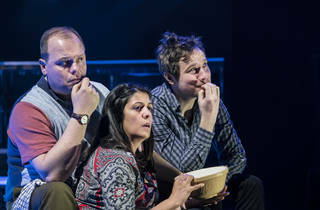 Though Graham never comes down on one side of events, in the second half of ‘Quiz’ he depicts the show’s producers painstakingly convincing themselves of a conspiracy. They comb the mic tracks to create a recording that they believe shows Ingram’s guilt. But its relationship to reality is profoundly questionable. The prosecution of Ingram was a success, and prompted a sort of mass hysteria and trial by media that Graham suggests as having a kinship with the rush to invade Iraq and Afghanistan post-9/11 and the rise of Trump via ‘The Apprentice’ (both explicitly referenced in the show). And it’s not hard to join the dots to other major events, from the EU referendum to Facebook and beyond. A vote is taken at the end of each half to ask us if we think Gavin Spokes’s weak, affable Ingram was innocent or guilty. 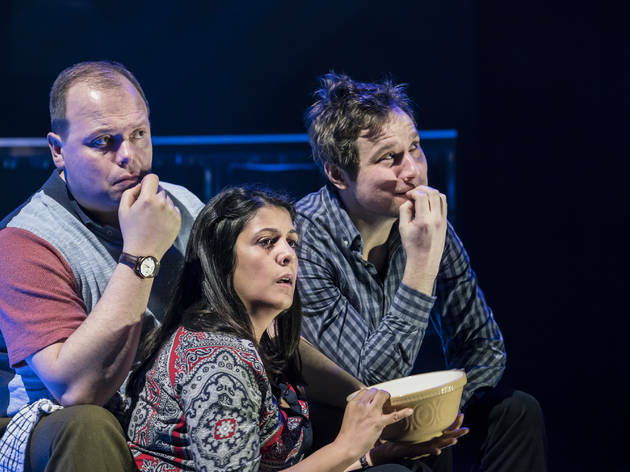 The pattern on most nights – as it was on press night – is for a majority guilty verdict at the end of the first act and a majority not guilty at the end of the second. But this doesn’t necessarily feel like a vindication for Ingram, more a proving of Graham’s point on the malleability of public opinion when presented with selective facts, on something that shouldn’t really be ours to vote on in the first place. We vote how Graham manipulates us to vote. 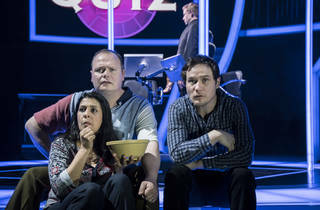 There is a certain glibness to ‘Quiz’, a sense that it uses bells and whistles and demonic chutzpah to prod us along rather than more conventional virtues of solid characterisation or watertight plotting. 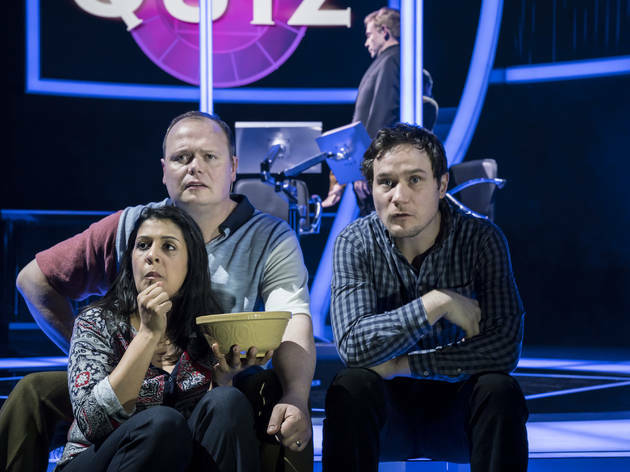 But form follows function, and ‘Quiz’ is a ruthlessly efficient piece of entertainment that raises an alarm about the dangers of ruthlessly efficient pieces of entertainment. The glory days of ‘Who Wants to be A Millionaire?’ may be over, with its scheduled Jeremy Clarkson-fronted revival essentially a retro curio. But Graham suggests that we are living in a reality based upon its founding principles, and it’s not clear that we have any lifelines left. One of the biggest scandals in UK TV is brought up quite successfully on stage! 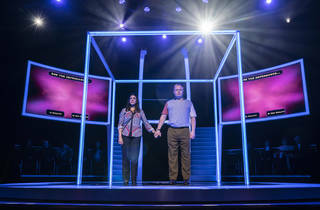 Clever set design & stage arrangement that puts some of the audience literally on stage. Great cast & atmosphere across the whole play. 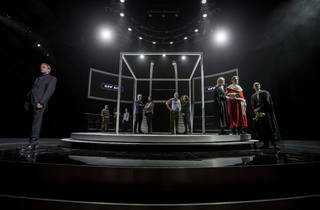 In addition, the audience participates by voting twice on mid & end of the play on who thinks is guilty. A great night out! I really enjoyed this show, where the audience got to be the judge of one of the biggest scandals in game show history. Keir Charles was hilarious as Chris Tarrant (and a host of other quiz masters), he got all his mannerisms spot on, even down to the way he licks his lips and scratches his nose, a true character actor. I felt the play tended to be style over substance at points and something felt a bit lacking. Overall I do think it's an entertaining, interactive piece of theatre, with nostalgic nods to game shows gone by. 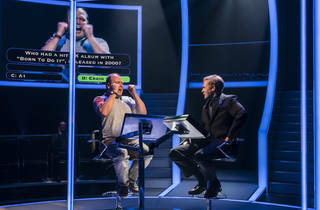 Fittingly for a stage show based on the 'Who Wants To Be A Millionaire' coughing scandal (truly a Major Fraud), I phoned a friend to see if they wanted to see this with me and I'm so glad they did. 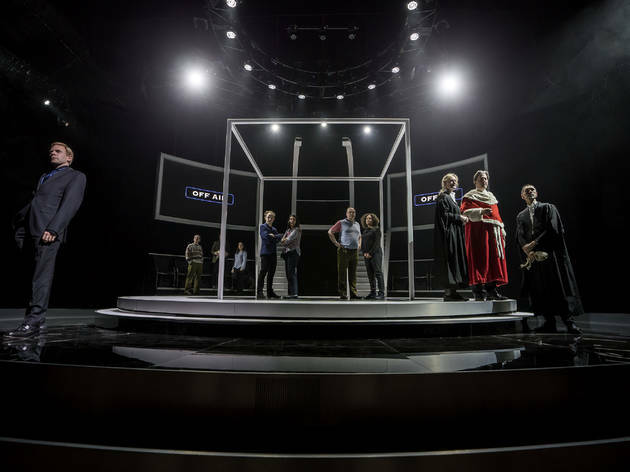 This is a wonderful staged and interactive tale of two halves, first recreating the known series of events from the trial, followed by a second half showing it from the contestant's (Charles Ingram's) perspective. Audience members get to vote on whether they think the Ingrams are guilty (and noticeably the guilty % varies greatly between the first and second half). For game show fans, there are some lovely nods to other shows of that ilk including Bullseye, Take Your Pick and The Price is Right (best not to be in the front row if you don't feel like participating). Worth the admission price alone for for Keir Charle's take on Chris Tarrant, this is a fun and thoughtful reminder of one of the UK's biggest ever game show scandals. Based on the infamous coughing scandal this play was split into two distinctive parts. The first part explored the psychology of quiz shows and how they had a deep impact on British society. It also explored the case for the prosecution in the court trial that followed. The second part concerned the case for the defence. The quote from Pablo Picasso, “We all know that Art is not truth. Art is a lie that makes us realize truth at least the truth that is given us”, perhaps made us a bit more forgiving afterwards to the plight of the Ingram. This was a fully interactive experience with the show asking us if we thought the Ingrams were guilty at the interval and at the end. It was interesting to see how people’s positions changed during the course of the evening. Watch out for Keir Charles interpretation of Chris Tarrant as well as a host of other Quiz show titans during a nostalgia filled production. When I saw this come up it brought back memories of sitting on the sofa with my nan and grandad on a Saturday night and how seriously the afore mentioned took the scandal. I thought it may be a good nostalgia trip and it didn’t disappoint there! The gimmicks of the pub quiz and the keypad were quite a fun interactive part of the show and I enjoyed the “ask the audience” side of it. The actor who played Chris Tarrant was bang on with all the mannerisms and catchphrases but this was a play of two halves. I definitely enjoyed the first half compared to the second and if I’m honest, I got a bit bored towards the end- I don’t know if that was just because of the portayal of the story in the second part though! Maybe I just didn’t know what to expect from this play though and if I was just to go by the first half I would have rated it much higher- just for all of the references to other game shows (HERE’S WHAT YOU COULD HAVE WON..). For anyone who watched Who Wants to be a Millionaire or other quiz shows, this is a flashback to the past. This play sports a clever set design with some fun audience participation, including a rather hard pub quiz and audience voting keypads. The story is well written and there are some laugh out loud nuggets, particularly in the form of the actor playing Chris Tarrant who gets the mannerisms down to a T! However like many other reviews, I liked, but didn’t love it. I wasn’t too sure about the casting and if I am being super harsh thought some of the acting was a little am-dram (with the exception of Tarrant). The concept is clever and they made it into a good story, but one that needed some serious editing – the second half kicked off with gusto, but descended into a rather boringly long court scene, which left my eyes feeling heavy. All in all, a bit of fun and great for feelings of nostalgia, but it didn’t blow me away. I'd obviously heard about the Who Wants To Be A Millionaire scandal and was rather interested in the idea of a play being made out of it! I was really impressed with the audience interaction which blurred the lines between play and reality right from the very start! The play gave me an insight into both sides of the Guilty / Not Guilty story but despite what seems to have shifted to a story from the defendants side I still go with my Guilty verdict! It did open up flaws in the evidence provided and made me wonder if ITV themselves actually had a part to play in it. Guilty or not? That is a question that will not be answered by going to see Quiz… And it’s probably better that way. Relating the true story of the biggest and most obvious cheat in a TV game show, Quiz is a super well constructed play, in two acts, where you get two see the two sides of the story: that of the TV production company who claimed that Major Ingram and his wife had cheated and that of the Ingrams who tried to prove their innocence. 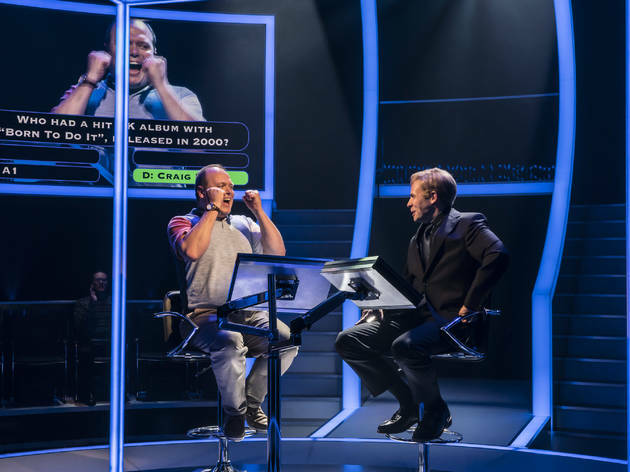 The play is very interactive, allowing you to give your opinion on different questions with a very similar pad to the ones the audience have in ‘Who wants to be a millionaire?’ and also participate in a pub quiz. The cast is really talented, especially Keir Charles who is hilarious playing about 10 different roles during the play. The play got me very nervous as, as the play gets nearer to the end, I got more and more convinced of the Ingrams’ innocence but already knew they’d been found guilty. It is a very interesting and entertaining play I would greatly recommend! A script that possibly only a British audience could understand - hence the short run - but superbly delivered. The impersonation of Chris Tarrant was hilarious, as was the small appearance of "Leslie Crowther". Interaction with the audience kept the play alive and the cleverly written "defence" at the end of the play, had the audience feeling a more sympathetic towards Mr Ingram on the final vote. Entertaining, fast-paced and amusing. We all remember the scandal of the coughing cheats ; Captain Charles Ingram successfully answered the one million pound question to bag the big prize. But did he? That episode of Who Wants to be a Millionaire was never aired. Instead it went to court. Charles's sister, Diana and one or two others were quiz competitor obsessive; they practised on fastest finger home made machines, swatted into the early hours and devised a plan. The play has fun moments of interaction. We are taking part in a quiz and ultimately we are given a fifty fifty chance to judge whether the captain is guilty or not. Of course, everything is rigged. The quiz shows themselves are rigged with a different type of question being given when general questions on kings and queens of Great Britain prove too middle class. Our voting is rigged, unsurprisingly. But the play is cleverly divided into fifty fifty: one half is for the defense while the other is for the prosecution. There are entertaining moments throughout, one choreographed to highlight the coughing itself. Treat yourself. Great seats and I did enjoy the interactive part of the show and the audience participation very much. Brought back some memories of having watched Who Wants To Be A Millionaire back in the day and the Chris Tarrant impression was pretty good too. Overall, maybe a little bit too far-fetched with the way the play acted, had a good time nonetheless. James Graham has done it again, he has cleverly portrayed Major Ingham story of the ‘coughing trial’ when he was claimed to have fraudulently won Who Wants to be a Millionaire. The set was inpressive and we each had our own key pads and in true pub quiz style were able to answer some questions! The show brought back a lot of Saturday night nostalgia, and the guy who played Christ Tarant was spot on. I liked this play, but didn’t love it. Felt as if something was missing and just lacked a bit of pazazz! The immersive interaction was good and the judges defended and prosecuted the major very well. If you are a big fan of the show or quiz shows go and see it!